Ladies and gentlemen, it’s time for a showdown! Ok… we admit that may seem a bit dramatic since this is not really a battle per se. As you’ve noticed, skin care is very important to us, and these brushes play an important role in our routines. So since we each have our favourite face brush… well that’s the perfect opportunity to share why we love them. After talking to Ash about hers, and then spending many hours watching YouTube reviews, I had originally wanted to purchase the Clarisonic. I tend to not mind spending what is necessary on my skincare, but maaaan the price is really steep. Like, my Huetiful Hair steamer costed less. 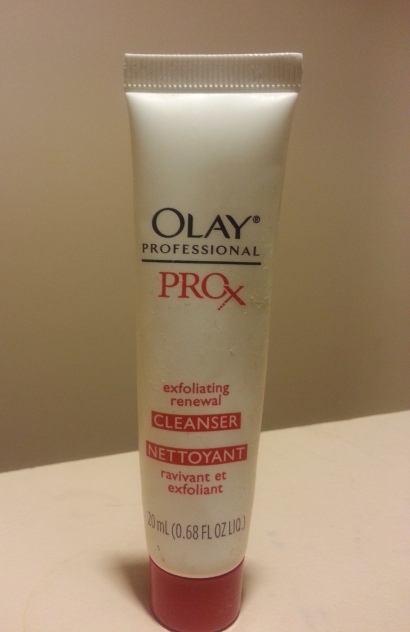 So since I’m a Diva on a Dime with an unrelenting hope in the universe, I started reading about other brushes and the one that stood out the most was the Olay Pro X. Reviewers said it was affordable and reliable, and I decided it was worth a shot. And then when I made the decision, there it was…. ON SALE for $23 (Original price is around $35). It was fate, really. The brush came with a small size (20ml) of the Exfoliating Renewal cleanser which I mentioned in my skincare regimen. I enjoyed the cleanser, but when I ran out I didn’t repurchase only because I was trying other scrubs. It however did a great job exfoliating my skin. The brush fits comfortably in my hand and runs on 2 AA batteries. I have had it for over a year, and only recently replaced them so that turned out to not be a concern. It closes pretty tight, so I don’t worry about water getting into the battery area. In fact, it closed so snug that I couldn’t get it open to take a pic! It has two speeds: a low and high, but I always use it on high because the low is too gentle for my liking. Get in there and clean out that dirt! But it’s nice to have the option, especially for those with extremely sensitive skin. The brush rotates which I really like because I feel like the circular motion is really getting into my pores and scrubbing out all the dirt. I use it at night along with my La Roche-Posay Effaclar Gel and work it into a nice lather and my skin always feels so smooth and renewed afterwards, as compared to when I only use the gel. I just have to gently place it on the surface of my skin and it goes to work. And without fail, I can’t keep my hands off my face once I’m out of the shower. You know how when you cleanse, tone and moisturize, right? You cleanse, thinking “oh yah I’ve totally washed my face”. But then you use toner and ALL this dirt comes off? Well this doesn’t happen when I use this brush. I feel like it really cleans all dirt off my skin, which is always evident when I remove the brush from my face and look at what’s left behind on it. When I use toner, there is nothing to see on the cotton pad. I’d say it’s doing its job and I’m happy with my decision. It’s become an important part of my skin care regimen. 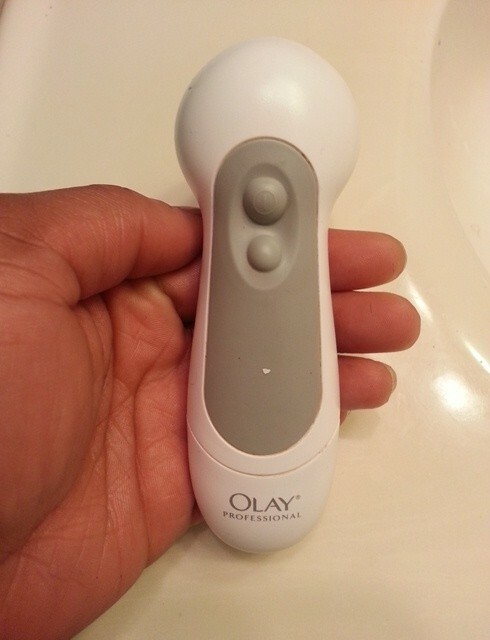 If you’ve been trying to decide on a face cleansing brush, but can’t spend the money on the amazing Clarisonic, the Olay Pro X is a good choice. I purchased the replacement brushes (2 in a box) for under $20 – again on sale (score!). The regular price I believe is closer to $30. I have had my Clarisonic for about 3 years, if not more. I went to get a microdermabrasion, and the facialist asked me to wash my face. After I thought I had washed all of my makeup off, she told me to wash it again using a Clarisonic and a bowl of water. Washing my face a second time, I was shocked by how much makeup came off in to the water. I read up online and found that the Clarisonic can remove up to 6x more makeup from your skin than just cleansing with your hands alone. Sold. Pioneered by a team of engineers and entrepreneurs in Seattle, Washington, Clarisonic combines proprietary technology with a revolutionary vision to redefine skin care. Originally developed for skin care professionals to use in treatment, Clarisonic quickly became the #1 cleansing brush recommended by leading dermatologists, aestheticians and spa professionals* – transforming the skin care industry, one pore at a time. I went with the Clarisonic Mia in green. Let me pause my Clarisonic review for a moment and insert a little rant. Ready? 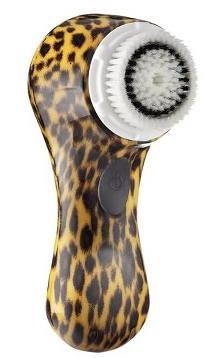 When I was purchasing my Clarisonic, I REALLY wanted the limited edition leopard print one. Like, really. How cute is that? I know it’s just a brush to wash my face with. But, if I’m going to spend the money then why not get the cute one! At the time, the limited edition one was available on the Sephora website. But, only available to ship to the United States. Also, not available in stores at all. ANNOYING. So, yes I settled for the green one. Still cute but not the same ( insert pouting Ash face here). Ok I digress, back to business. The Clarisonic Mia that I have, retails for $145 CAD. It is the smallest, and most basic Clarisonic. I just wanted something simple to clean my face, so I chose the model without any bells and whistles like body attachments or multiple speeds. I use my Clarisonic one daily to remove my makeup. I have some friends who found this to be way too much exfoliation for their skin , but my face is fine with it. It doesn’t irritate or scratch my skin at all and I have certainly noticed an improvement in my skin’s brightness and clarity since I incorporated it in to my routine. The Clarisonic comes with a sensitive brush head that is recommended for all skin types. Also available to Canadian Clarisonic shoppers: delicate for fragile or dry skin, normal for uncompromised skin ( what does that even mean, Clarisonic? ), deep pore for all skin types with enlarged pores. The American Clarisonic site however offers more brush head choices: acne cleansing, velvet foam, cashmere, satin precision ad pedicure. Jipped again, Canada! 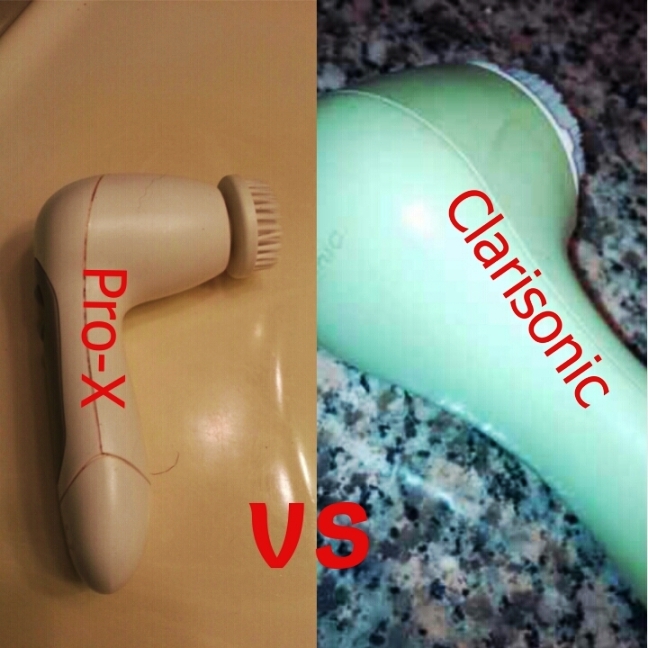 Brush heads are $30 CAD and they are supposed to be changed every 6 months, so the Clarisonic can be a pricy endeavor. But, I feel that if there is any place not to skrimp, it is on taking care of my skin. I always purchase the sensitive brush head but would really like to get my hands on the cashmere one as I have heard great things. 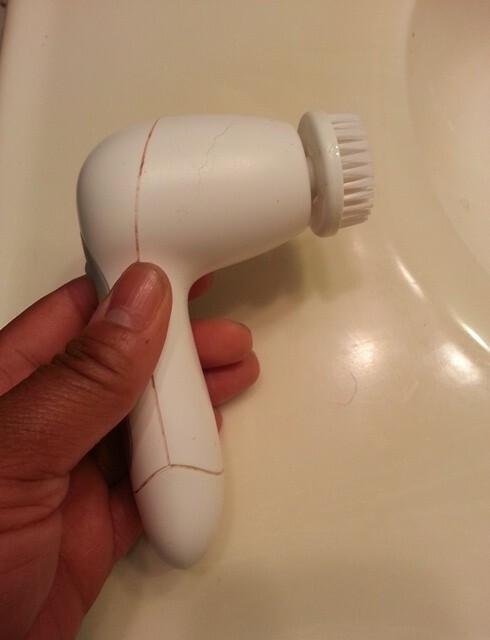 I use my Clarisonic along with my Normaderm cleanser. I make small circles around my face for one minute. The Clarisonic beeps and turns off when one minute is up. I find that when I tone my skin afterwards, the cotton pad is makeup free. I feel good knowing that I have successfully removed any gunk from my face, preventing clogged pores and any subsequent breakouts. The Clarisonic is really well made and sleek. It is easy to travel with and doesn’t get any water in it when I take it in to the shower. It lathers my Vichy Normaderm cleanser very well and leaves my face with a sqeaky clean sensation without feeling stripped. I am glad I purchased the Clarisonic and my skin has certainly improved with continued use of it. That being said, it is extremely pricy and I am not sure if the same results could be achieved with any face brush. So there you have it! Different brushes but with the same happy gals. So, whatever your budget allows, treat yourself to that cleansing brush you’ve had your eye on! If you already use one, what’s your preference? In fact, we’ve talked so much about our skin care, let’s hear what you do in the comments! DIY Whipped Hair & Skin butter… using the Nutribullet! I don’t have either device, nor any other at the moment, but I appreciate all the info in these reviews – it will help me to make a decision when I am ready to get one. I will probably go with a less expensive one, but I think the Clairsonic sounds very cool. Also, I really like Vichy products in general, and their Normaderm cleanser is a favourite of mine. Thanks ladies!